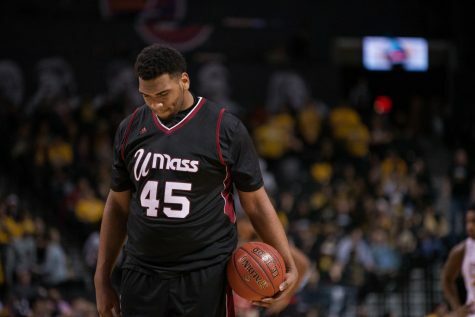 The late-game heroics finally ran out for the Massachusetts men’s basketball team. 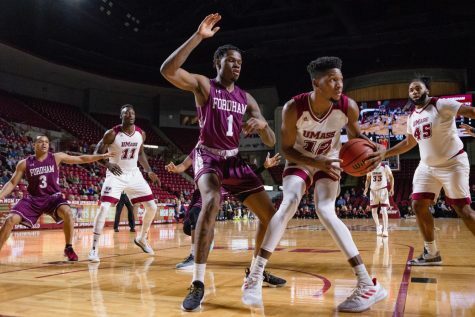 Miami (Fla.) was too much in the second half Saturday as the Hurricanes wore down UMass with a 24-10 spurt to close out the game, topping the Minutemen, 75-62, in front of 7,004 fans at the Mullins Center. A Jesse Morgan layup gave UMass (3-3) a 52-51 advantage with eight minutes, 29 seconds remaining in the contest, but Rion Brown drilled a triple for Miami (5-1) the next trip down the court to regain the lead and jumpstart the Hurricanes’ dominating run down the stretch. 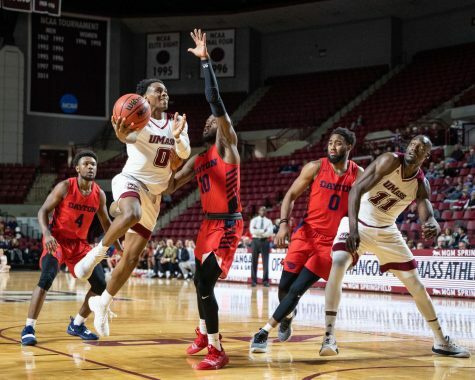 The Minutemen got to within three with 6:02 left, but Reggie Johnson added a thunderous and-one on a lay-in after running over Terrell Vinson’s attempt to draw a charge. The officials whistled it a block and Johnson hit the free throw to give Miami a six-point cushion that it would not relinquish. 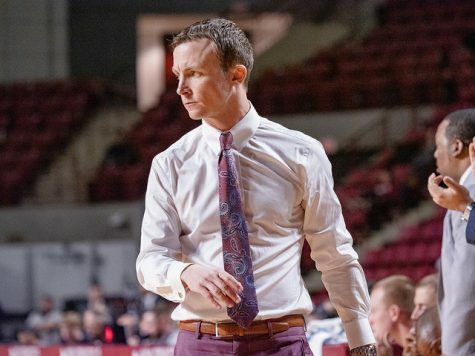 “That was the run that kind of broke us,” UMass coach Derek Kellogg said. Vinson finished with a double-double (14 points, 11 rebounds) to lead a balanced Minuteman attack. Chaz Williams added 11 points and 10 assists of his own in the defeat. 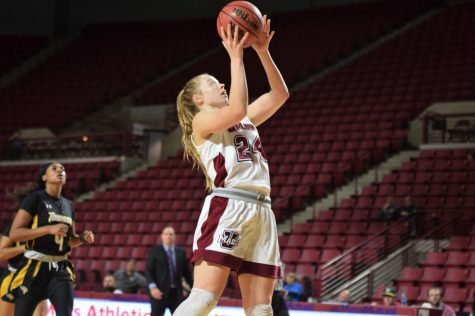 UMass struggled mightily from the 3-point line, hitting just 7-for-32 (21.9 percent) highlighted by Morgan’s 1-for-10. 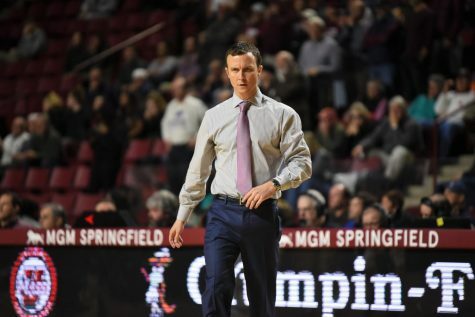 Kellogg said after the game that he’s fatigued from continuing to say the shot-making needs to improve, as the Minutemen are just 28.8 percent from 3-point range on the season. But Kellogg felt the shots were good looks for his guys that simply weren’t going down, which raised the issue of whether or not the team is taking too many threes or just needs to start hitting them. Kellogg added that he needs to continue to be positive with his team as it suffers through its shooting slump and also felt the shots were good looks. 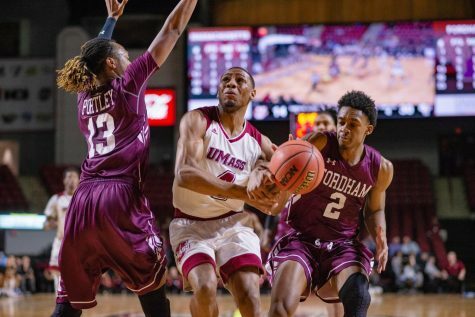 UMass had to take so many threes because of its inability to find production in the post. Miami dominated inside, outscoring the Minutemen, 32-18, in the paint. Johnson used his 6-foot-10, 292-pound frame to carve out 19 points — 13 in the second half — to lead all scorers, while also grabbing 13 rebounds and swatting six shots. 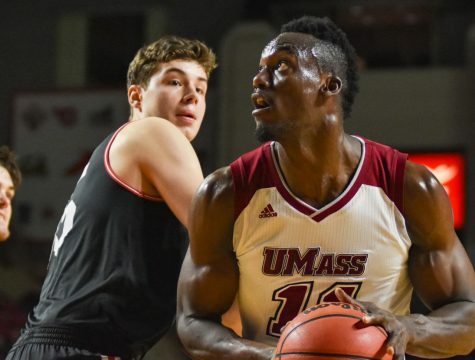 Johnson manhandled UMass center Cady Lalanne in the post, who finished with just four points on 1-for-7 shooting. 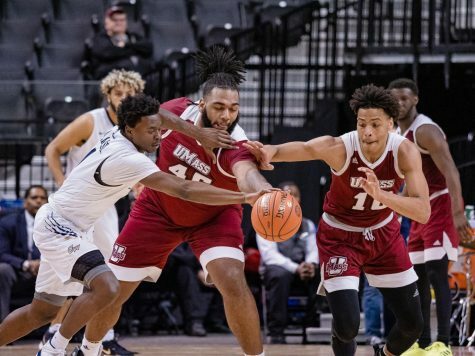 UMass led for the majority of the first half despite shooting just 25.7 percent from the field and 15 percent from 3, but the Hurricanes hung around and ultimately took a 30-25 lead into halftime. 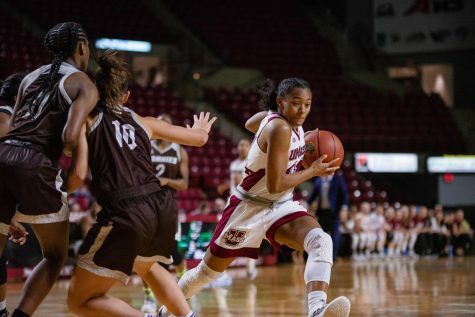 Coming into the game, late-game heroics had been the Minutemen’s specialty after hitting three go-ahead shots in their final possession in each of their wins this season. And after Morgan’s go-ahead layup, it seemed like there might be just a tad more magic left for UMass. But Williams said the team’s inability to knock down shots brought the heroics to a screeching halt Saturday. The Minutemen are back at it on Tuesday when they travel to Boston to take on Northeastern for a 7 p.m. tip-off.